This Taxco treasure is truly an artistic masterpiece – it spans a huge 2 1/2″ at its widest point, and it boasts an awesome 118 gram weight – it has been crafted from a superior 950 silver!! This cuff-styled bracelet showcases a gorgeous blend of lush jasper inlays as well as an exquisitely textured floral motif – artistic excellence!! 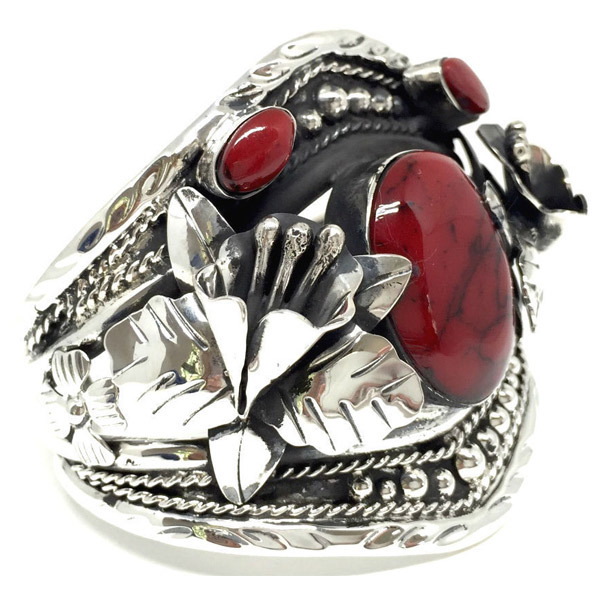 This piece has been punctuated by a niello darkened finish to the silver, and it offers a wearable length of approximately 7 1/4″ (including the gap) – exceptional deco styled Taxco artisan work!! This bracelet is hallmarked “Mexico 950 TA-178”.